Stuart Clayton and Paul Lancashire celebrate success in the Manchester Half. Wesham runners were out in force in the Fairclough Five mile race around the very scenic lanes of Stannah from the Wyreside Country Park, the event in memory of Bob Fairclough a much loved local runner from Cleveleys. With an undulating course Rob Danson was a clear winner in 26:08 but Blackpool’s Luke Minns was tailgating in 26:34. Paul Gregory had a good run as he targets a return to performance, finishing 9th in 30:22 and 2nd M40, just holding off a fast finishing Lee Barlow who placed 10th in 30:37 for 1st M45. Garry Barnett was running well again with 31:46 for 14th place and 1st M50. The Wesham men took the team win. Peter Cruse was 2nd M55 and 16th with 33:17 and Lee Nixon ran well in 19th place with his time of 34:18 and 5th M35. Rob Wallace came in 25th in 35:16, a good result. Carmel Sullivan finished 5th woman and 1st W50 in 35:40, 27th overall. Stephen Browne came in 36th and 3rd M50 in 37:25; Martin Allison 40th with 38:02; Sharon Cooper was 8th woman and 2nd W45 and 46th in 39:10. George Kennedy turned in 47th place and 3rd M60 with 39:11 dragging in Ben Wrigley with a good run for 48th place in 39:23. James Danson was 52nd in 40:32; Kay Twist 9th woman, 3rd W45 and 55th in 41:03; Finlay McCalman 59th in 41:36; Phil Leaver struggling in the cold and damp with 42:33 for 65th place but 2nd M65; Steven Gore and Vicky Gore 67th and 68th in 43:02 and 43:03 (14th woman and 2nd W40); Peter Cooke had a good run for 4thy M55 in 71st place with 44:06; Jo McCaffrey 18th woman, 3rd W40 and 74th in 45:17; Tanya Barlow and Louisa Denye 19th and 20th women (78th and 79th overall; 4th W45 and 4th W40) in 46:17 and 46:18; Sally Deacon 25th, 3rd W50 and 84th in 47:34; Sue Rigby 30th, 7th W45 and 90th overall with 49:00. 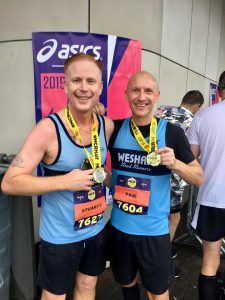 There were four Wesham members running in the Manchester Half Marathon in very wet conditions and Paul Lancashire and Stuart Clayton smashed their personal best time for the 13.1 miler. First in for Wesham was James Mulvany who clocked 1:17:24 for 74th place. He came in 9th M40 in an obviously class international field. Paul Lancashire finished 1082nd in 1:36:43. Stuart Clayton was 1376th in 1:39:08 for 54th place in the M50 category. David Millar finished 4016th in 1:54:37, and Catherine Nicholls was 1481st woman and 5719th overall in 2:03:35. Kath Hoyer finished 6th woman and 51st overall 1st W55 in the Wilton Arms Serpent 6 trail race through the Smithills Country Park on a 6-mile distance from the Belmont Road in Bolton in a time of 50:15. Dave Waywell was 2nd M70 and 80th in 58:39. There was a good turnout at the Lytham Hall parkrun on Saturday morning with 9 runners from Wesham, with cold and windy weather brewing it was fresh but good for running. Jonathan Lawson ran 21:35 for an M50 age graded performance of 68.88%. Ben Wrigley had an excellent run with 24:03 for M35 performance of 55.93%. Paul Eccles scored 25:01 for an M35 53.76 percentage, while Stephen Twist ran 25:13 for M50 59.52%. Peter Rooney clocked 25:33 for M60 62.75% and Elizabeth Johnson ran 26:47 for a W35 grade 56.75%. Finlay McCalman clocked 27:35 for M50 55.23%; Antoinette Holton 28:01 with a senior women’s 53.18%. Sharlan Butcher recorded 29:02 for W45 54.71%. Nigel Shepherd clocked the 20th fastest time of the day in the Preston parkrun with a time of 20:44 and an M60 age grade of 77.33%, a good result. Robert Brown finished with 26:06 for M60 62.01%. In the Walsall Arboretum run in Birmingham Debbie Myerscough ran 30:33 for a W55 58.48%, a creditable run as she returns to fitness and longs to get back on the fells. The Wesham parkrun tourists were out at the Abingdon run in Oxfordshire, with David Taylor running a conservative 20:23 for a Senior grade of 63.52%. Vicky Gore ran 27:51 for W40 55.66% and Steven Gore was running conservatively with his fractured metatarsal to finish with 27:51 for M35 47.94%. James Mulvany was on half-term holidays and took in the Porthcawl parkrun, finishing 3rd fastest in 17:22 for an M40 78.60%, his fourth run at the venue but his slowest time here. Stuart Clayton gave the Cuerden Valley a run for his money with his debut time of 24:05 for an M55 grade of 61.25%. Martin Bates was out in Keswick and he clocked 25:54 for M60 62.48% but a lot slower than his previous run of 23:38, perhaps weather bound. Graham Cunliffe was the only Wesham runner at the Blackpool Stanley Park run, with a time of 29:30 for M60 55.31% as he continues to suffer from a tight hamstring. There were more out at the Fleetwood Promenade run, with Simon Denye running the second fastest time of the morning with a speedy 17:47 for M45 79.76%, this week’s top performance for Wesham. Mark Renshall nipped up and down the course in 20:22 with an M45 grade of 69.64% and George Kennedy returned an M60 grade of 75.74% with a time of 21:22, a good performance. Brian Jones ran 30:33 for an M55 grade of 51.17%.